Today I shall mostly be pogo-ing aggressively to “Walking Distance” by Buzzcocks. I had one of those moments this morning where you see how other people behave and wonder if you’re actually looking in a mirror – could that be how other people see me? It was over breakfast in the White Lion – I was sitting on my own, opposite a table of four older walkers – all westers of course – they were giving the poor girl who was doing breakfast a right run around. I don’t think I’m especially picky or fussy – there’s plenty if things I don’t like, hate even and I’ve recorded many of them within these pages, but I’m more of a moaner than a fusser. If there’s something I don’t like I will record it, maybe say something at the time, if I think it will make any difference, but I won’t make a fuss. Nothing was right for these four – they had the girl running all over – warm milk for the coffee, not cold; could they have herbal tea – not the peppermint she then brought – herbal dear, herbal! Do you have any marmalade for the toast – not jam – it can’t have bits in though. My friend can’t have milk, do you have any milk-free spread for the toast. Do you have any vegetarian sausages!?! If it wasn’t so unfair it would have been funny. Why the hell do these people leave home, when all they find elsewhere is inadequate and not up to standard. Breakfast in the White Lion was fine, not a patch on Brookfield of course, but then where is – it was still more than adequate and set me up nicely for the morning. 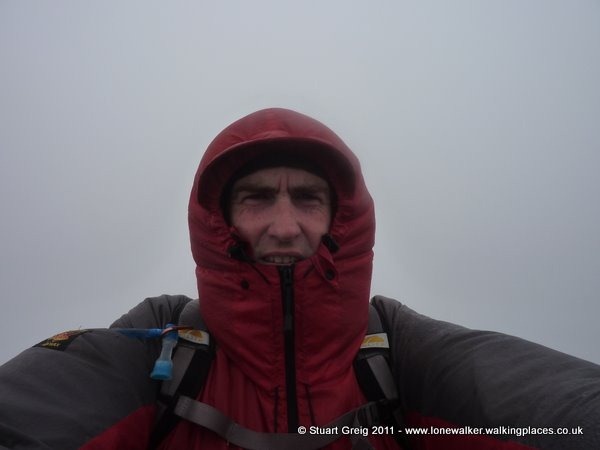 A morning which was grim and grey and cold – everything yesterday morning hadn’t been. It had rained most of the night and even lying in bed (window open on a warm night) I could hear the cars passing through puddles in the street. Rather than vacillate over what to wear today, I couldn’t make my mind up which route to take. The clothing decision was a no-brainer; overtrousers over no trousers and baselayer beneath Paramo jacket, with a fleece in the pack for the tops if it got really cold. 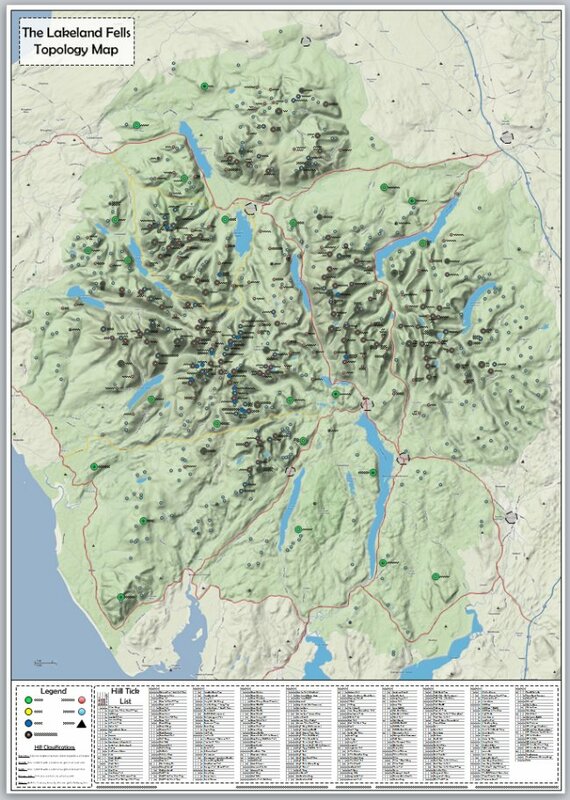 My original route plan had been along the road, up Dovedale, Priests Hole, Hart Crag, then east side of the Fairfield Horseshoe to Rydal then along the paths to Grasmere. 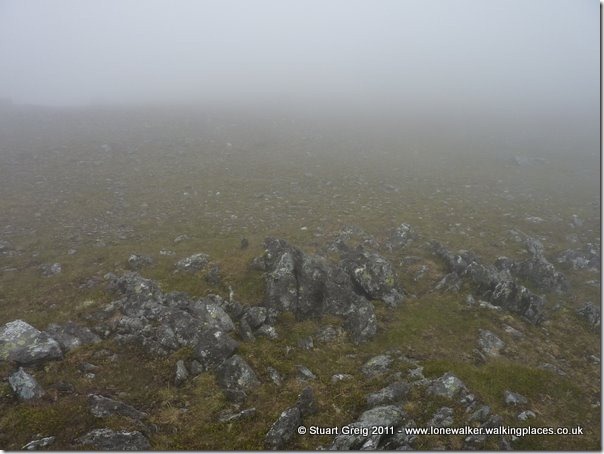 I sacked that when I saw the weather – I still wanted to go high, but not so long. 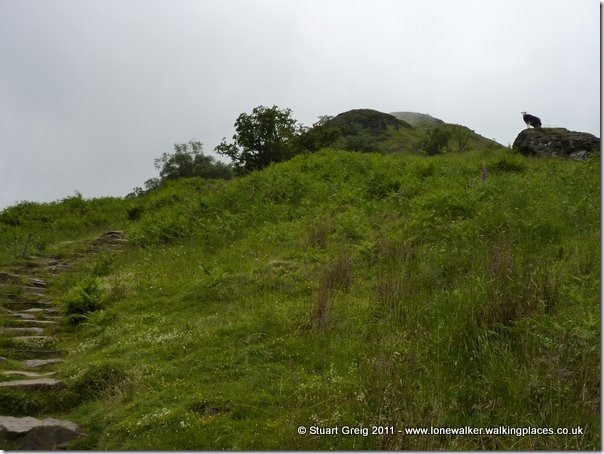 I decided on St. Sunday, Fairfield and Stone Arthur – a total of about 3000 feet and 8 miles, finishing just opposite my B&B which would let me in at 2pm. 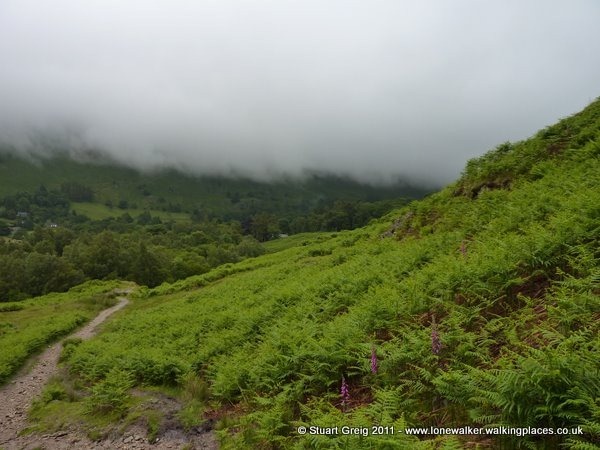 Leaving Patterdale, everyone in Wets and preparing for the worst. Either route would be short and I didn’t need to leave early, so I lounged for a while and eventually set out at about 9:40. 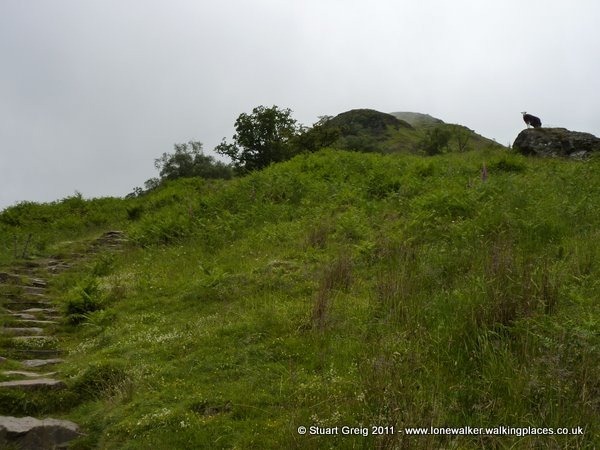 It wasn’t raining, not properly, in fact it was beguilingly warm and muggy, especially as I started to climb up the steep slope of Thornhow End. I had all my vents open, on the top as well as bottoms and I was still beginning to leak alarmingly. I took off my Tilley – thinking that may help with the warmth, but it just meant I had to rub the sweat out of my eyes more regularly. 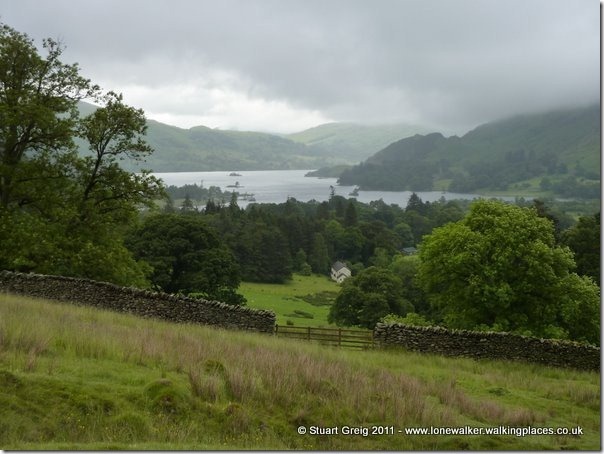 I got some cracking views back down to Ullswater, despite the low cloud. A lone sheep stood sentinel over the path – until I got close then he scarpered – but was back again within a minute when I turned round. At this point I was hoping for a drop in temperature and perhaps a breeze to ease the mugginess – never let it be said that I don’t sometimes get what I wish for. The path beyond the initial steep climb is great – it hovers close to the edge and you get great views down into Grisedale and onto the fell opposite. Within 10 minutes I was into the cloud – the temperature plummeted – I closed all my vents. The wind came up and it started to rain – steadily at first, then heavily, then blown on the wind at high speed, straight into my face. It was bloody cold for the start of summer I can tell you. How on earth can two consecutive days in June be so different? 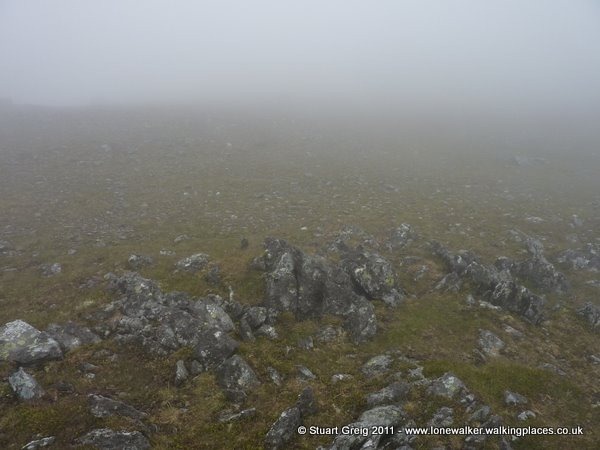 By the time I reached the summit I was chilled, wet and a bit fed up – this wasn’t the way the Lakes section of my C2C walk was supposed to be – it was too bloody “business as usual”, just like any other wet and horrible day walk. 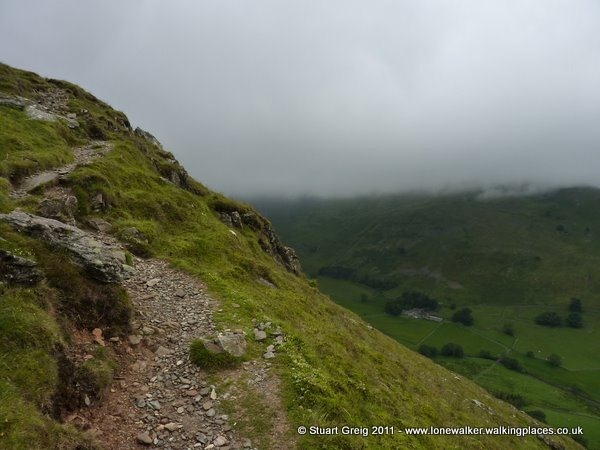 I got to Deepdale Hause and canned the rest of the high path – I dropped down to the tarn at Grisedale and decided to rejoin the original route. 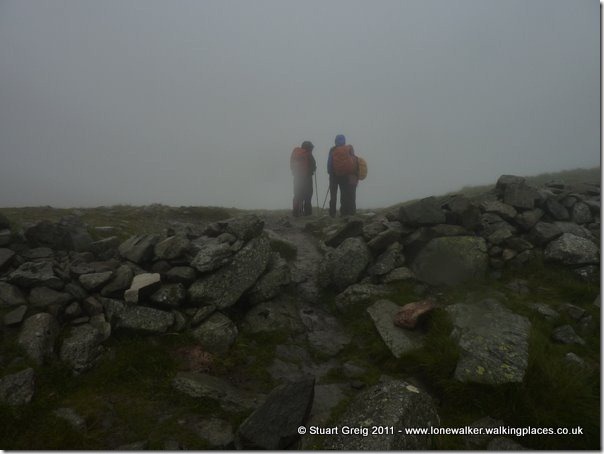 It was very wet on the way down – both in the air and on the ground. Better than the last time I came down this path though – in March (2007 I think) under several feet of snow, Tex and I just basically jumped and rolled down the slope to the tarn. I can’t believe how rocky it is – these weren’t visible last time. 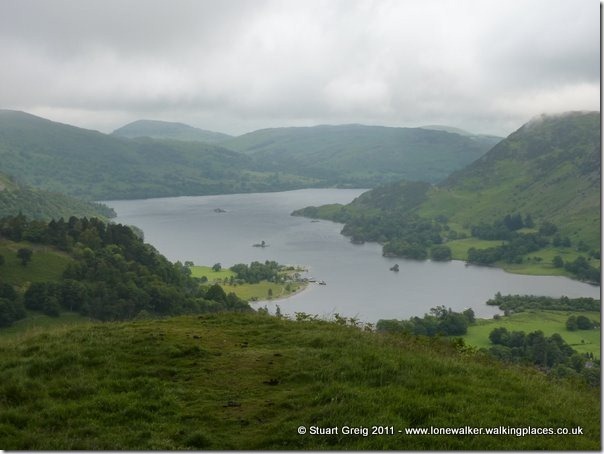 I started to meet lots of people now – probably westers coming from Grasmere, but also day walkers I’m sure. 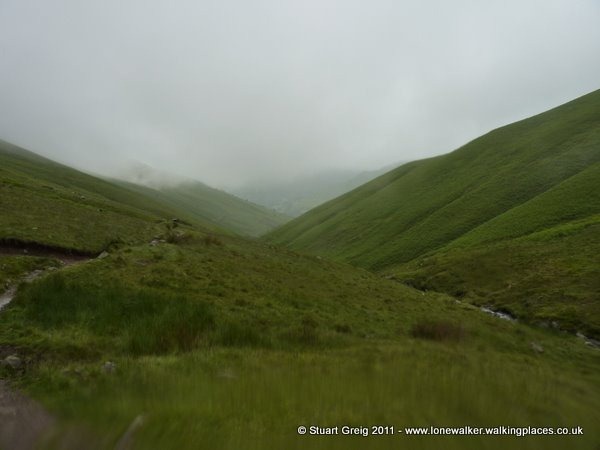 I got to Grisedale Hause and found four people poring over a very damp looking map. They were wet and appeared to be lost. Pointing along the tracks down to the tarn and up to Fairfield, as if unsure which was the right way. I’m never sure in these circumstances whether to offer advice, or wait to be asked. I normally say nothing, other than “hello” and probably “how are you?” – a leading question that offers them the opportunity to ask for help. This lot didn’t say anything – I might as well not have been there, so I left them to their decisions and pressed on down the path now. When I’d bumped into Brian on Sunday, he’d mentioned that one of the bridges was out at the bottom of Great Tongue – I’d listened, but had in the back of my mind that it wouldn’t affect me as I’d be using a different descent route. His words came back to me now and I started to wonder what the right track would be. There was a lot of water in the system and a damaged bridge could be a big problem. I needn’t have worried though, as I came across a sign beside the path – which told me of the bridge outage and suggested an alternative route – it even had a little map, which showed the proposed route change – but it passed over the broken bridge. I was a bit confused – had they got the map wrong? Why would they divert you away from a broken bridge, only to divert you along a path that used it? As I was pondering what to do, a guy arrived from the path I wanted to take. I asked him about the bridge and he said it was not a problem as there was stones to use to cross the river and the water wasn’t high enough to cause problems. I said my thanks and pushed on down the path. The path incidentally is fantastic – it gets loads of use of course, and is well maintained. It also runs beside one of the most scenic becks in the Lakes; lovely steep sides, green and lush and roaring white water falls all along its length. It was still raining – as you can see from the shot above – the lens was so wet it wouldn’t focus properly and I had nothing dry enough to clean the lens. I passed a young lad and an older woman – they coming up the path quite slowly – I’m guessing it was his Mum. He asked me how far it was to the top – I said quite a while yet. The lady was outraged! “But the man we passed before said we were nearly there”. I suggested he was lying to her, or possibly trying to help ease their burden. I estimated they had 40 minutes of climbing as I’d left the top 20 minutes before. They weren’t happy. I passed the man on the way down – well I say man, but both the two people were women – short cropped hair by all means, but certainly women. 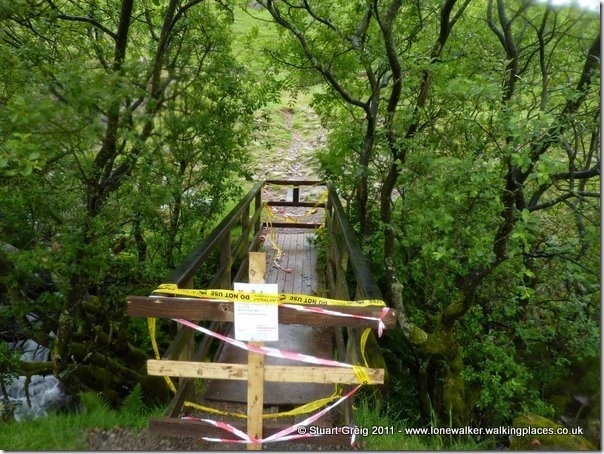 I reached the bridge at the bottom of the beck and decided it was probably OK to cross if I was careful. I didn’t need to scramble down the steep muddy bank and up the other side. The tape and cross boards made it awkward, but I scooted across using edges of the base, where you could see there was no problem. 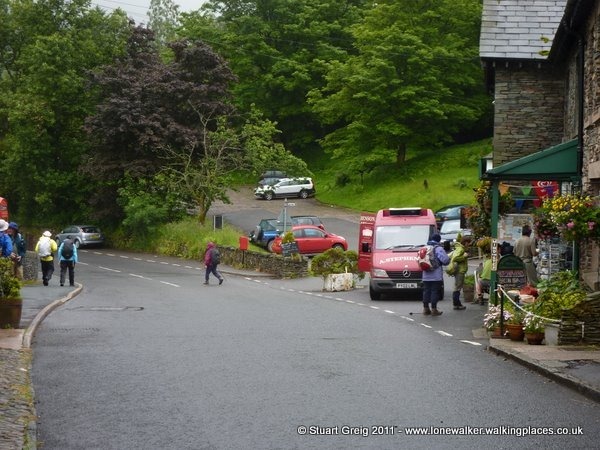 I stopped in at the Travellers Rest on the way down into Grasmere. I was too early even for a B&B that prides itself on letting guests check-in at 2pm. I had a small coke and a bag of crisps and sat nursing the drink for 40 minutes, before I left and ambled slowly down to Chestnut Villa. 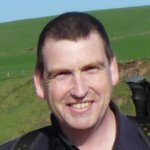 It’s a cracking place – I have a double bed again and great WiFi – even in my room, so I can get this blog up to date and include a few photos too. I popped into town to buy some supplies for the last few days – there’s no shop now until St. Bees (unless I stop at Honister), so I wanted some treats for the evening and some bits for lunch. I’ve just had some food in the Swan Hotel – which was OK, but bloody expensive and I’ve managed to avoid a rain shower on the way back too! I don’t expect I’m going to have WiFi for the rest of the trip, so no more photos and possibly no more entries unless I can get a reasonable phone signal. Tomorrow night I’m in Stonethwaite and I don’t think I get a signal there, then it’s Ennerdale Bridge and finally St. Bees on Friday night. I’ve been reading the comments – I really appreciate them – they help keep my spirits up – even if I can’t always reply to them. Signing off now – thanks again and lets hope for better weather tomorrow so I can do my route through the Langdales. Dave – Chestnut Villa was lovely, right close to the C2C path too. I don’t think I’ll be doing the C2C again now until my grandson is old enough to walk it and I’ll take him. So maybe 2020. 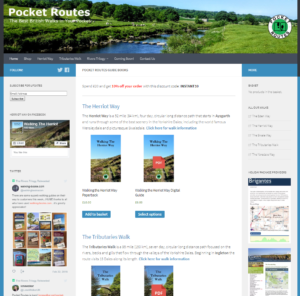 Doug – Would love to turn round and go back, but won’t have a job if I do 🙂 I took a stock of Herriot Way guide books with me in the baggage and posted them as orders came through on my PayPal iPhone app. Customer service eh! Thats a grand picture from the Old Corpse Road over Mardale Head but I missed it last month going eastward – I think I didn’t turn around at the right time to see it. You made a good choice to abandon your route at Deepdale Hause and not go over Cofa Pike in that weather – its not an easy climb in the best of weather. I’m enjoying catching up on your blog after being away for several days. I am loving your blog, photo’s etc. Planning to do the walk in September, reading this helps so much with the planning. I’m really enjoying the diary, good photos too. Paramo is all good stuff, although, I do like Montane too. I must put my walk report on the Walking Places, once, I’ve done the C2C E-W in August. It has just dawned on me that you will be finishing soon. Could you turn around when you get to St Bees and walk back the correct way :-).Otherwise we are not going to have anything to read next week. Hi there Lone Walker your going great guns and smashing reports really enjoyable. You can get a wi-Fi connection in the Sheppards Arms in Ennerdale if youe want to upload there might cost you a pound for the charity box though. Please to hear of your thoughts about Chestnut Villa just this week I’ve booked myself and Tina into there for our 2012 crossing. Keep it up now far to go now then you can start thinking and planning about doing all again. Look forward to your post every night, hope you can keep it up over the last few days. In the picture of you today it looks like the middle of winter, hopefully it will improve for you. Enjoy the final stretches, hope the weathers better. Summer started today, so it’ll be fine!